Our goal is to give dealerships an environment where they can deliver great guest service, and that starts with a clean and welcoming facility. We work with the manufacturer’s specifications for all materials to ensure the best image is represented. And while we’re in your dealership, our installers maintain a professional appearance and are trained in soft skills for any potential customer interactions. H.J. Martin and Son installed over 16,000 square feet of tile at the Bergstrom Victory Lane Body Shop location. Les Stumpf Ford was in need of a major remodel of its existing car dealership. H.J. Martin and Son was tasked to remove existing flooring, including ceramic tile, in order to install the new finishes. With a quick turnaround, H.J. Martin and Son installed premium, high-quality large format ceramic tile and consistent grout joints at Bergstrom Cadillac's state-of-the-art facility. 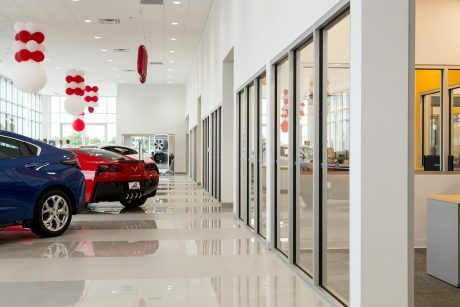 Bergstrom Maserati was looking for a luxurious feel in its showroom to match the luxury of its vehicles. Broadway Automotive's project involved the installation of a variety of glass, flooring, and drywall by H.J. Martin and Son. H.J. Martin and Son crews installed large format ceramic tile throughout the Bergstrom Fiat dealership. © 2019 H.J. Martin and Son.